Andrew Trimble, the 33-year-old rugby wing from Ulster and Ireland, has officially announced his retirement, effective at the end of this season. In the next few weeks, Trimble will end a career that has made him the most-capped player of all time (and in Ulster history) with 229 appearances, and having played 70 times for Ireland. The Coleraine winger helped lead Ireland to Six Nations titles between 2014 and 2015, under the leadership of Joe Schmidt. He was the starting wing when Ireland defeated New Zealand back in 2016, on the soil of the United States of America. In 2007 and 2011, Trimble played in both rugby World Cups, with his grit, intelligence, and defense making him one of the premier players in the tournament. He began his playing career back in 2005, and given how much of his young life he's already given this game, Tri0mble admitted that the decision to retire was extremely difficult, as being able to play for both Ulster and Ireland was the culmination of his childhood dreams. Interested in laying down a rugby wager? Head to Sbobet 365. Former Ireland national rugby union teammate Brian O'Driscoll, whom Trimble replaced to make his debut, lauded the eloquence of the retirement statement made by Trimble. 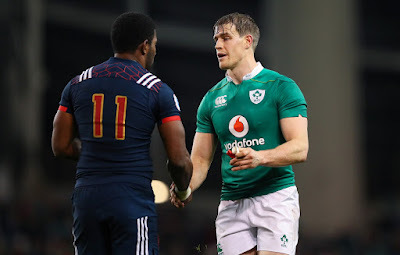 Many other rugby players around the country and the world took to social media to voice their admiration of Trimble as well. Bryn Cunningham, the operations director for Ulster, emphatically stated that Trimble should be nothing but proud as he looks back on his distinguished rugby career. Cunningham referred to Trimble as "a class act both on and off the pitch," and someone who served as "a great ambassador for Ulster Rugby." Cunningham then went on to state how Trimble did so much off the pitch, expanding the reach and the popularity of the sport for many generations to come. Shane Logan, one of the team's chief executives, offered his public thanks to Trimble, who served as a distinguished role model for the nation's youth. Having known Trimble since the latter was 20 years old, he was able to watch Logan "grow up" into one of the country's true sports legends, playing with a relentless style and infectious enthusiasm that embodies the spirit of the nation in general. Trimble was also beloved by many of the daily beat writers who covered him, as he was not only refreshingly honest and "comfortable in his own skin," but he also showed a rare level of empathy towards said reporters, understanding the near symbiotic relationship between athletes and the press. Trimble always toed the line between stating exactly what's on his mind, without giving away too much. Still, he realized that those reporters were looking to build stories out of any sound bytes, good or bad, so he would go out of his way to provide them with something of substance, while even poking fun at himself -- along with other athletes -- for any mention of the usual sports clichés. A devout Christian, Trimble reads Psalm 84 before every match, in preparation for the game ahead. In general, Trimble will go down as an Ulster legend, with such a reputation being very well deserved.